The problem with traveling is sometimes you fall in love, and that love is usually intense and ephemeral, because someone – eventually – will depart. 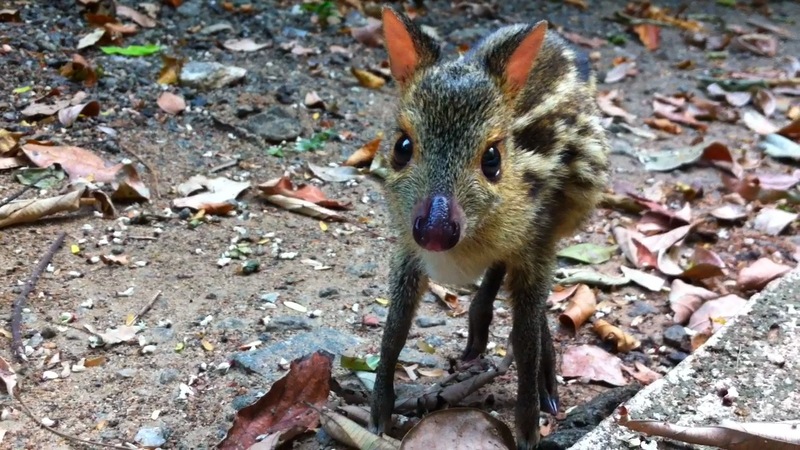 This time, I fell in love unexpectedly… with a mouse deer. It all started when I was out in the ancient ruined city of Polonnurawa, Sri Lanka. It was about 7am, sweltering hot, and the BBC documentary film crew was in action trying to incite a confrontation between two toque macaque monkey troops. I was milling about uncertainly at the periphery, feeling a little useless, when I noticed the project lead and a field assistant looking intently at something on the ground. I wandered up, and saw that they were looking at this incredible little creature that was nestled underneath a shrub: a baby mouse deer. I immediately thought it the cutest animal I had ever seen, and judging by the smiling faces all around, I wasn’t the only one. When it was suggested that I keep an eye on it for a few hours I happily agreed. I was ready to do my part and guard this little guy from danger! As well as see if the mother would return, or if he was well and truly alone in this big world. I spent the morning sitting on the grass near the mouse deer, gently corralling him when he strayed too far. He was a pretty plucky little guy, not even a half hour had passed when he ventured unsteadily on his tiny legs to see what I was all about before nestling back into the security of his shrub. At one point, a bunch of toque monkeys came close, curious to see what I was looking at. I instantly picked him up and shielded him – he didn’t struggle or protest and seemed quite content to sit with me afterward. I knew right then that this encounter was something special. As the mother was still nowhere in sight and the mouse deer was very weak, we decided to bring it to the research camp and see if we could help it live. And that was the beginning of a wonderful relationship. It took to infant formula after some coaxing, and after a day or two it was starting to nibble on figs, and banana, and even leaves. What was really amazing was how instantly he connected with people. Curious, I read up on the mouse deer, discovering it was part of the family chevrotain – well and truly a deer as opposed to mouse, and one of the most ancient mammal species. Finding a baby is also a rare occurrence, the project lead here hadn’t ever had a mouse deer baby in camp in over 40 years of field work. In fact, scour the Internet and you’ll find precious little on raising a baby mouse deer. Despite his rarity, day by day he got stronger and our hopes grew that he would become a wonderful addition to the camp – maybe even a film star for the next BBC shoot! He would take to following me, bouncing around at my feet and coming when called, running across the camp floor and sliding all over the place on his tiny hooves. As the days passed, I would spend hours watching him, petting him, feeding him, walking with him… It was a source of – I fully admit – continual joy to open the box every morning and see these bright eyes looking up at me, followed by a tiny u-shaped stretch as I’d bend down to take him out of the box. Unfortunately, the time we had was cut short. I had to leave camp for a few days, planning to be back on my birthday. While I was gone I thought of the mouse deer daily, worrying and hoping that he would be ok during my absence. Things got complicated when I was gone, and I was asked to delay my return by a day. I wish so much now that I hadn’t, as my return one day later was to the news that the little mouse deer had died that morning. He had lived until my birthday like I had hoped for… but like the story of the monkey’s paw, the wish had a flip side, as the day after he tried to jump out of his box and I guess the fall was too much for his delicate body. When I returned to camp I went to his box sadly and said goodbye, stroking his broken little body. His spirit was already gone, and there was no trace of the life that had animated such a wonderful creature. I moved his small hooves in the air a bit, and brushed his tail, but under my hands there was only stillness. 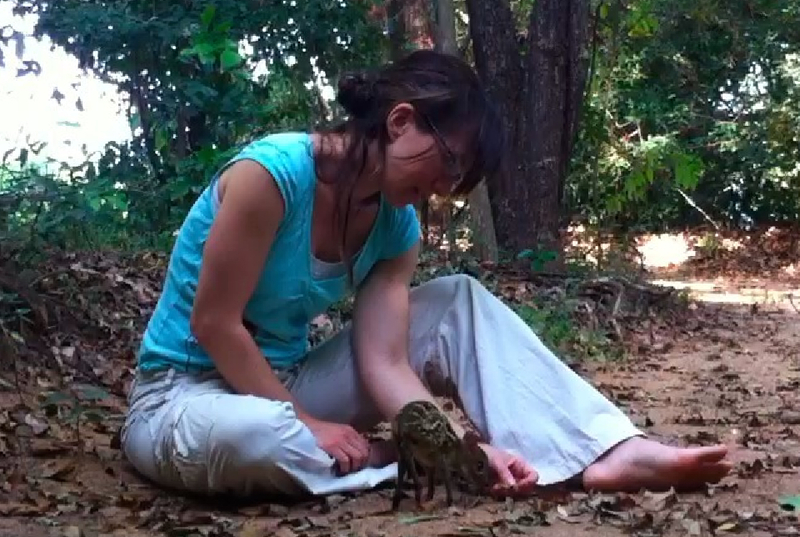 Looking back, I had been given the indisputable gift of spending time with an unusual and brave little animal. Although I’m profoundly grateful for the time I had with him, I wish those bright eyes would have shined on just a little longer. 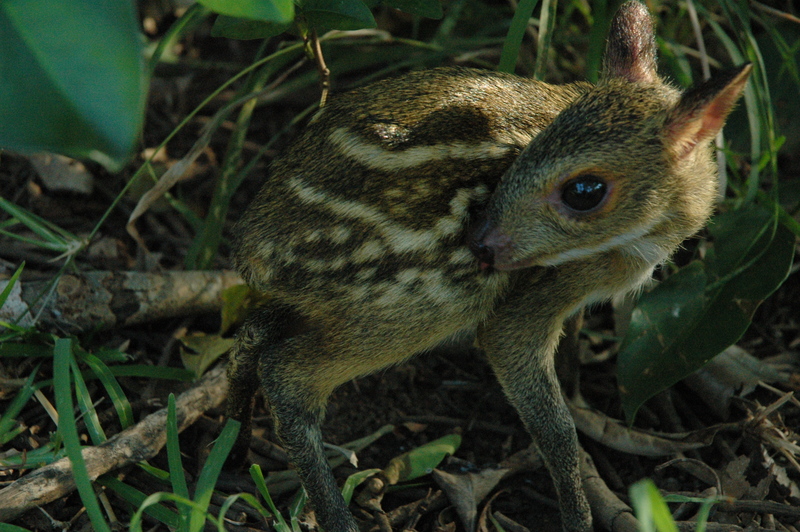 This entry was posted in Philosophy, Sciency stuff, Writing and tagged baby mouse deer, bbc macaque, chevrotain, cute mouse deer, cutest animal ever, mouse deer, mouse deer pet, mouse deer pictures, mouse deer story, mouse deer video, polonnaruwa mouse deer, raising a mouse deer, running mouse deer, sri lanka monkey camp by simonandfinn. Bookmark the permalink. I must agree that this has to be one of the sweetest little creature alive! You are definitly lucky to have had some time to nuture such a gentle thing. Looking at how bambino was running towards you had me wishing I could have been there to help… I’d love to see a bunch of these little critters running around my yard! Thanks for sharing.